Please note: new stock *is* shipping to Amazon. Please place orders with them as per normal. If you need the book urgently, we would recommend clicking on "Free Delivery Worldwide" (below) and using The Book Depository. This comprehensive volume presents the biographies of 1,000 women who were active in the British decorative arts over the last few centuries. Some of these women are known today, some are not, yet all made valuable contributions in areas such as stained glass, metalwork, pottery, woodcarving, illustration, bookbinding and decoration, sculpture, decorative embroidery, decorative jewellery, and illumination. 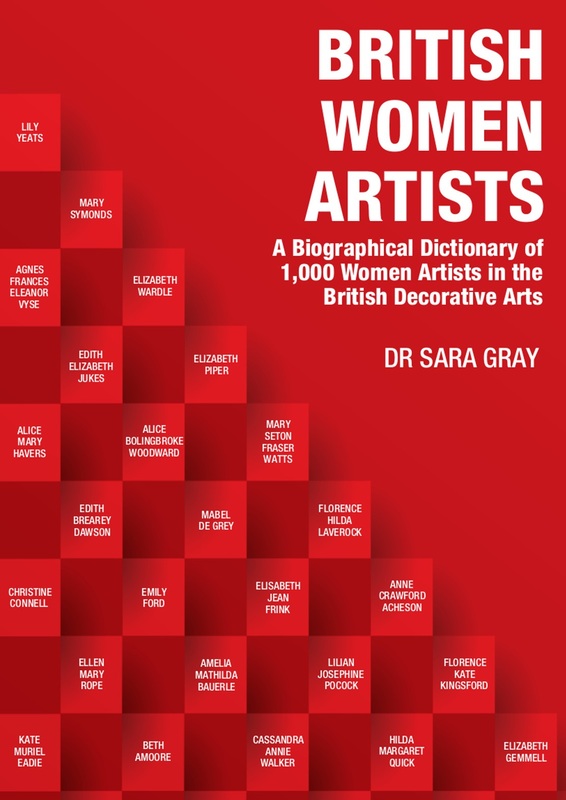 This volume is the largest of its kind to document the lives and careers of some British women artists and decorative artists, published in Britain to date, and helps to shed new light on a still-neglected area of British art and design history. It includes entries for well-known artists such as Barbara Hepworth, Mary Lowndes, and Alice Woodward, alongside influential but forgotten women such as Mary Symonds, Amy Singer, and Catherine Donaldson. Researched and written by Dr. Sara Gray over a period of eight years, this book is her third to be published. She completed a B.A. Hons Degree in 1992 at Bolton University, followed by a Ph.D. in 2002 awarded by Manchester University. She has a particular interest in the work of British women artists and in regional arts and crafts. For a full list of women in the dictionary, please see below. Febuary 8th 2019 | ISBN-13: 978-1-911121-63-3 | 396 pages | Print and eBook formats will be available. ADAMS, MINNIE WALTERS – SEE ANSON, M.W. ADENEY, ELAINE THERESE – SEE LESSORE, E.T. ALDERTON, DOROTHY EILEEN – SEE ANDREWS, D.E. ALLCOTT, MAUD B.S. – SEE BIRD, M.B.S. ALLEN, ALICE – SEE PATTINSON, A.
ALLEN, EVELINE M. – SEE WATTS, E.M.
ANDREWS, EDITH ALICE – SEE CUBITT, E.A. ANDREWS, EMILY JANE – SEE HARDING, E.J. ANDREWS, MARY FRANCES – SEE CRANE, M.F. ANTROBUS, MARY – SEE SYMONDS, M.
BAILEY, RUBY W. – SEE LEVICK, R.W. BAKER, FRANCES CAUTLEY – SEE FARRELL, F.C. BARBER, FLORENCE G. – SEE RICHTER, F.G.
BARNETT, ALICE MAY – SEE COOK, A.M.
BASS, IRENE – SEE WELLINGTON, I.
BEALE, AILEEN MARY – SEE ELLIOTT, A.M.
BEECHEY, RUTH – SEE LATTER, R.
BELL, EDITH M. – SEE UNDERWOOD, E.M.
BELL, ERNESTINE E. – SEE MILLS, E.E. BELL, MARY ELIZABETH – SEE DAWSON, M.E. BETTS, GERTRUDE E. – SEE MORGAN, G.E. BISHOP, DOROTHY L. – SEE MAHONEY, D.L. BLUNDELL, JOAN – SEE WARDLEY, J.
BOGER, MARGARET A. – SEE WALLACE, M.A. BOLTON, ELIZABETH E. – SEE HOUGHTON, E.E. BOND, IDA – SEE NELSON, I.
BOTT, MARY EMMELINE – SEE BATTEN, M.E. BOURNE, MURIEL – SEE WHEELER, M.
BOWDON, ERICA M. – SEE HASTINGS-GRAY, E.M.
BOWERLEY, AMELIA MATHILDA – SEE BAUERLE, A.M.
BOYCE, EDITH – SEE LLOYD, E.
BRADSHAW, GRACE E. – SEE ROGERS, G.E. BRAUN, MARION W. – SEE STANFIELD, M.W. BRENNAND, JANET M.G. – SEE MARSH, J.M.G. BRIDGE, VERA E.C. – SEE OSBORNE, V.E.C. BRIER, ELIZABETH – SEE SCOTT-MOORE, E.
BROOKE, IRIS E.M. – SEE GIFFARD, E.M.
BROOKS, IRENE G. – SEE HEATH, I.G. BROWN, GERTRUDE – SEE DALE, G.
BROWN, VIOLET MARY – SEE COPESTICK, V.M. BUDDEBERG, GRISELDA – SEE ALLAN, G.
BURNEY, GLADYS D.F. – SEE MELLIAR, G.D.F. CALDWELL, MARY H. – SEE BIRD, M.H. CALLCOTT, FLORENCE – SEE NEWMAN, F.
CANNING, MARY BELLA – SEE HOUSTON, MARY G.
CARRE, JEAN L. – SEE HADAWAY, J.L. CARTWRIGHT, ENID M.M. – SEE PEATE, E.M.M. CHADBURN, GRACE – SEE CHRISTIE, G.
CHALMERS, GLADYS – SEE MacCABE, G.
CHAMPION, ELLA L.C.S. – SEE NAPER, E.L.C.S. CHANTRELL, MARY E. – SEE DEAR, M.E. CHILTON, MABEL B. – SEE LOW, M.B. CHILTON, PHYLLIS I. – SEE OSBORNE, P.I. CHRISTIE, VERA – SEE WILLOUGHBY, V.
CHUBB, JOAN KATHERINE – SEE DUMMETT, J.K.
CLAGUE, DAISY RADCLIFFE – SEE BERESFORD, D.R. CLARK, CHRISTINE M. – SEE SELLER, C.M. CLAUSEN, MAY SOPHIA – SEE CREAMER, M.S. CLAY, PHYLLIS M.C. – SEE ARCHIBALD, P.M.C. CLOUGH, KAY – SEE ANDERSON, K.
COBB, CATHERINE ANNE – SEE COCKERELL, C.A. COCKLE, AGNES F.E. – SEE VYSE, A.F.E. COLE, MARGUERITE – SEE KIRMSE, M.
COLLINGWOOD, MARY ETHEL – SEE WHILE, M.E. COLLYER, KATE W. – SEE WALKER, K.W. CONWAY, ANNE SEYMOUR – SEE DAMER, A.S.
COOK, MARGARET M.E. – SEE FITTON, M.M.E. COOPER, OPHELIA GORDON – SEE BELL, O.G. COX, DOROTHY – SEE LEWIS, D.
COX, ETHELWYN M. – SEE BAKER, E.M.
COXON, ELIZABETH – SEE GOULD, E.
CRUMP, JANE – SEE ABLETT, J.
CUTNER, EFFIE S. – SEE SMITH, E.S. DARNELL, JANET – SEE LEACH, J.
DAVEY, ELSIE M. – SEE LINDSLEY-SIMS, E.M.
DAVIES, EMILY GRACE – SEE BARNSLEY, E.G. DAVISON, MINNIE D. – SEE SPOONER, M.D. DAWSON, GEORGINA F. – SEE MURE, G.F.
DE LA MARE, CATHERINE – SEE DONALDSON, C.
DICKINS, DOROTHY G. – SEE PELTON, D.G. DIMMOCK, MARTHA A. – SEE ONIONS, M.A. DOBELL, JOAN KEVAN – SEE GREENHALGH, J.K.
DODD, AGNES – SEE SHUTER, A.
DUGDALE, AMY K. – SEE BROWNING, A.K. DUNKLEY, EDITH E. – SEE MARTIN, E.E. DUTTON, CONSTANCE – SEE THOMPSON, C.
DYAS, ELLA – SEE HALLWARD, E.
EARNSHAW, MABEL LUCIE – SEE ATTWELL, M.L. EDEN, ELIZABETH – SEE FIELD, E.
EDWARDS, GEORGINA H. – SEE BOWERS, G.H. ELLIOTT, GLADYS – SEE GRIMSHAW, G.
ELLIS, HILDA M. – SEE LITTLER, H.M.
ELMORE, EDITH CONSTANCE – SEE LAW ADAM, E.C. ELPHINSTONE, MARY H. – SEE McCLINTOCK, M.H. ELVERY, BEATRICE MOSS – SEE GLENAVY, B.M. ELWIN, AMY M. – SEE SINGER, A.M.
EMMERSON, GLADYS E. – SEE PETO, G.E. ENTWISTLE, GLADYS – SEE LINES, G.
ETHERINGTON, LILIAN M. – SEE REYNOLDS, L.M. EVANS, ELLEN M. – SEE SHENTON, E.M.
EVERSHED, ADA – SEE GELL, A.
EYRE, MAUREEN P. – SEE PROUDMAN, M.P. FAIRFAX, GERTRUDE – SEE CROCKFORD, G.
FARHALL, HILDA M. – SEE SARE, H.M.
FARQUHAR, ELIZABETH B. – SEE VIVIAN, E.B. FAULKNER, AILEEN M. – SEE HUMPHREYS, A.M.
FENWICK, SYBIL N. – SEE PRINGLE, S.N. FIELD, MARJORIE V.M. – SEE RHOADES, M.V.M. FIELDEN, CONSTANCE M. – SEE VILLIERS-STUART, C.M. FINNEMORE, SYBIL – SEE PARSONS, S.
FISHER, FRANCES – SEE CRAWSHAW, F.
FLETCHER, EDITH – SEE RAWNSLEY, E.
FOSBERRY, EVELYN MABEL – SEE BANKART, E.M.
FOSTER, MARCIA LANE – SEE JARRETT, M.L. FOWLER, MARY L. – SEE WALLER, M.L. FRANCE, GEORGINA E.C. – SEE GASKIN, G.E.C. FRANKLIN, DULCIE F. – SEE SASSOON, D.F. FREWEN, CLARE C. – SEE SHERIDAN, C.C. FRYETT, WINIFRED E. – SEE WALKER, W.E. GARDINER, LILIAN A. – SEE LANCASTER, L.A.
GARDNER, JESSIE M. – SEE RIDING, J.M. GARLAND, MARGARET – SEE COOKESLEY, M.M. GEDDES, NORAH – SEE MEARS, N.G. GEORGE, RHODA – SEE WAGER, R.
GIBBONS, ANGELA – SEE LATHAM, A.
GIBBS, CHARLOTTE I. – SEE NEWMAN, C.I. GIBSON, CHARLOTTE E. – SEE OSBORNE, C.E. GILFORD, NOEL – SEE ADENEY, N.
GINESI, EDNA – SEE COXON, E.
GLAZIER, BERTHA – SEE FROST, B.
GOGGS, EVELYN D. – SEE JOCE, E.D. GOLDSMID, EVELYN ISABEL – SEE BETHUNE, E.I. GORDON, ROSE G. – SEE HOLT, R.G. GRIMLEY, EDITH M. – SEE LINNELL, E.M.
GROOM, DOROTHEA JANE – SEE DIBDIN, D.J. GUERCIO, BEATRICE C. – SEE FREEDMAN, B.C. HALL, LILIAN M.B. – SEE ROWLES, L.M.B. HARCOURT, EVELYN ALICE – SEE CLUTTON BROCK, E.A. HARD, DEBORAH N. – SEE HARDING, D.N. HARE, DORA – SEE GORDINE, D.
HARGRAVE, ELIZABETH C. – SEE JAMES, E.C. HARRIS, ETHEL A.C. – SEE BOWER, E.A.C. HART, ELIZABETH V. – SEE POLUNIN, E.V. HART, MAY – SEE PARTRIDGE, M.
HATCHER, ROBERTA – SEE EVERETT, R.
HAYES, GERTRUDE E. – SEE MORGAN, G.E. HEINE, ROSIE M. – SEE PITMAN, R.M. HELLABY, RUTH – SEE HOLLINGSWORTH, R.
HENNES, HILARY M. – SEE MILLER, H.M.
HEWETT, IDALIA B. – SEE LITTLEJOHNS, I.B. HODGE, ESME V. – SEE SANDERCOCK, E.V. HODGKIN, ELIZABETH – SEE WATERHOUSE, E.
HOLDEN, MARGARET T. – SEE JONES, M.T. HOLDERNESS, HELEN A. – SEE PAGE, H.A. HOLLAND, HESTER GASKELL – SEE GORST, H.G. HOLMES, MADELINE R. – SEE WELLS, M.R. HOUGHTON, EVELYN E. – SEE JARMAIN, E.E. HOWARD, FERELYTH A. – SEE WILLS, F.A. HUTCHINSON, CONSTANCE E. – SEE ROWLANDS, C.E. INGAMELLS, IVY K. – SEE ROLLETT, I.K. JACOB, CHARLOTTE E. – SEE HUNTON, C.E. JAGGER, MARGARET LEAH – SEE BLUNDELL, M.L. JAMIESON, DOROTHEA M. – SEE SELOUS, D.M. JEFFERIES, KATHERINE G. – SEE HARTNELL, K.G. JOHNSTONE, DORIS – SEE ZINKEISEN, D.
JONES, CLARA ELLEN – SEE BILLING, C.E. JONES, GWENDOLINE M. – SEE WHITE, G.M. JONES, MARJORIE – SEE MEGGITT, M.
JONES, OLIVE L. – SEE WHITE, O.L. JONES, PEARL – SEE BINDER, P.
JONES, ROSE G. – SEE HOLT, G.
JONES, VIVIEN MASSIE – SEE GRIBBLE, V.M. JOSEPH, GLADYS – SEE HUNT, G.
JOY, MARY ELIZA – SEE HAWEIS, M.E. JUDD-MORRIS, LOUISA E.E. – SEE WOOLLATT, L.E.E. KEATINGE, ALYS F. – SEE TROTTER, A.F. KENNEDY, HAZEL RUTHVEN – SEE ARMOUR, H.R. KETTLEWELL, FRANCES – SEE CRAWSHAW, F.
KING, MARY ANN – SEE RAEMAEKERS, M.A. KNOWLES, CAMILLE B. – SEE WOOD, C.B. LAMBERT, HELEN G.C. – SEE MARSH, H.G.C. LEIGH, FRANCES E. – SEE RYDER, F.E. LESSORE, ADA L. – SEE POWELL, A.L. LEWIS, JANE MARY – SEE DEALY, J.M. LIPSCOMB, JESSIE – SEE ELBORNE, J.
LISTER, FANNY D.H. – SEE CALDER, F.D.H. LOCKHART, BETTY – SEE JOEL, B.
LOGAN, GLADYS CAROLINE – SEE BARRON, G.C. LOMAS, CHRISTINE – SEE CONNELL, C.
LOOSELY, ANNIE ISABEL – SEE POWER, A.I. LOVELY, MAUREEN P. – SEE PROUDMAN, M.P. McCANN, WILHELMINA L. – SEE NEUWIRTH, W.L. McCURDY, SYLVIA W.A. – SEE STEBBING, S.W.A. McDOWELL, HILDA M. – SEE SELIGMAN, H.M.
MacGREGOR, PHYLLIS M.H. – SEE BUSH, P.M.H. MacLAGAN, SHEILA – SEE LEA, S.
McLEISH, PHOEBE G. – SEE STABLER, P.G. McMURDIE, GERTRUDE – SEE HAMMOND, G.
MacNAIR, FRANCES – SEE MACDONALD, F.
MACBETH-RAEBURN, MARJORIE M. – SEE BACON, M.M. MACK, LIZZIE – SEE LAWSON, L.
MACKINTOSH, MARGARET – SEE MACDONALD, M.
MANGER, CLARE B. – SEE LANCASTER, C.B. MARTIN, SOPHIE FREDERIKA – SEE EVA, S.F. MASON, EDITH M. – SEE HINCHLEY, E.M.
MASON, JANET M. – SEE HAUGHTON, J.M. MASON, MURIEL B. – SEE JACKSON, M.B. MATHEWS, EDITH LAURA – SEE CALVERT, E.L.
MATHEWS, EVELYN – SEE HOLDEN, E.
MEESON, DORA – SEE COATES, D.
MESSENGER, EILEEN C. – SEE GREENWOOD, E.C. METCALFE, KATHLEEN I. – SEE MacKIE, K.I. METEYARD, KATE MURIEL M. – SEE EADIE, K.M.M. MIDDLETON, DORA THACKER – SEE CLARKE, D.T. MILMAN, SYLVIA F. – SEE WHITHAM, S.F. MILWARD, FREDA M. – SEE COLEBORN, F.M. MONSELL, ELINOR MARY – SEE DARWIN, E.M.
MOORE, GWENDOLINE B. – SEE WHITE, G.B. MORCOM, FRANCES I. – SEE SWAN, F.I. MORGAN, ALICE MARY – SEE HAVERS, A.M.
MORRIS, EDITH M. – SEE IRELAND, E.M.
MOSS, PHOEBE A. – SEE TRAQUAIR, P.A. MURPHY, ANIZA – SEE McGEEHAN, A.
NICHOLSON, BARBARA – SEE HEPWORTH, B.
NICHOLSON, CELIA ANNA – SEE LEVETUS, C.A. NORRISS, BESS – SEE TAIT, B. NORTH, EVA A. – SEE KNIGHT, E.A. NOTTIDGE, CAROLINE – SEE FRY, C.
OLVER, KATE E. – SEE HIGGINS, K.E. OSBORNE, NORAH – SEE SIMCOCK, N.
PAGET, WINIFRED – SEE TURNER, W.
PARGETER, CONSTANCE M. – SEE SKINNER, C.M. PARKER, CONSTANCE M. – SEE HOWARD, C.M. PARNELL, EDITH CAROLINE – SEE FARMILOE, E.C. PARTRIDGE, ETHEL M. – SEE MAIRET, E.M.
PATERSON, EGLINGTON M. – SEE PEARSON, E.M.
PAUL, DOROTHEA – SEE BRABY, D.
PEACEY, JESSIE MUTTER – SEE LAWSON, J.M. PEACOCK, MABEL R. – SEE WHITE, M.R. PEARSON, RUTH M. – SEE KEATING, R.M. PEART, EVELINE – SEE SIMMONDS, E.
PEGRAM, MARY CONSTANCE – SEE BUZZARD, M.C. PERCY, IDA – SEE NELSON, I.
PETRIE, EMELINE – SEE STEINTHAL, E.
PHIBBS, NORAH M. – SEE McGUINNESS, N.M.
PHIPPEN, AUBREY PAULINA – SEE EMONET, A.P. PIATTI, MARIA L. – SEE STEELE, M.L. POCOCK, HILDA JOYCE – SEE STEWART, H.J. POCOCK, JULIA – SEE STEWART, H.J. POPHAM, ROSALIND – SEE THORNYCROFT, R.
PORTER, MURIEL G. – SEE VALLIS, M.G. PORTWAY, HEBE – SEE COX, H.
POULTER, DIANA J. – SEE MURPHY, D.J. POWNALL, MARY – SEE BROMET, M.
PRINCE, LORNA B. – SEE KELL, L.B. PROUDFOOT, IVY H. – SEE GARDNER, I.H. RATE, LETTICE M. – SEE SANDFORD, L.M. RAVEN, CATHERINE H. – SEE HOLIDAY, C.H. READ, DIANA M. – SEE LALL, D.M. RICHARDSON, MAGGIE – SEE MITCHELL, M.
RICHARDSON, NELLIE – SEE BLACKLOCK, N.
ROBERTS, URSULA V. – SEE McCANNELL, U.V. ROBERTSON, KATHLEEN M. – SEE WALKER, K.M. ROBERTSON, NAN – SEE WEST, N.
ROBINS, IDA S. – SEE PERRIN, I.S. ROBINSON, EDITH BREAREY – SEE DAWSON, E.B. ROGERS, GRACE H.M. – SEE JOLLIFF, G.H.M. ROLLO, JESSIE G. – SEE PATRICK, J.G. ROWAT, JESSIE W. – SEE NEWBERY, J.W. ROWE, ELSIE – SEE THOMAS, E.
RUMBALL, MARJORIE E. – SEE TAYLOR, M.E. RUSBRIDGE, LILIAN – SEE ANDREWS, L.
SAMS, ISABELLA M. – SEE HARRISON, I.M. SANDISON, MARY S.L. – SEE WHITE, M.S.L. SAPSWORTH, KATHERINE E. – SEE MALTWOOD, K.E. SCOTT, FLORENCE K. – SEE NASH, F.K. SCOTT, HELENA ALICE – SEE CUNDELL, H.A. SCOTT, HILDA C. – SEE POPE, H.C.
SCOTT, HILDA MARY – SEE CHIRM, H.M.
SCOTT, JANET – SEE HAIG, J.
SEALY, STELLA – SEE ROSS-CRAIG, S.
SELIGMAN, AUDREY – SEE BLACKMAN, A.
SETH, GERTRUDE – SEE MASSEY, G.
SHARMAN, GRACE E. – SEE ROGERS, G.E. SHAW, CAROLINE E.E. – SEE PYKE-NOTT, C.E.E. SHIPP, FLORENCE A. – SEE KENDRICK, F.A. SICKERT, CHRISTINE DRUMMOND – SEE ANGUS, C.D. SICKERT, ELAINE THERESE – SEE LESSORE, E.T. SILVER, LEONORA K. – SEE GREEN, L.K. SINGLEMAN, BARBARA – SEE TRIBE, B.
SKEAPING, BARBARA – SEE HEPWORTH, B.
SKEAPING, LILY E.J. – SEE KAUFMANN, L.E.J. SMALL, EVELYN M.B. – SEE PAUL, E.M.B. SMEDLEY, CONSTANCE – SEE ARMFIELD, C.
SMITH, EDITH – SEE HOLDEN, E.
SMITH, GERTRUDE – SEE BAYES, G.
SMITH, GWENDOLEN B. – SEE ROSE, G.B. SMITH, WINIFRED – SEE GREEN, W.
SOWERBY, MABEL MARGUERITE – SEE ANNESLEY, M.M. SPARLING, MAY – SEE MORRIS, M.
SPOONER, GERALDINE – SEE CARR, G.
SPURGE, LOUISA – SEE JACOBS, L.
STEWART, ALICE C. – SEE MAUDE, A.C.
STURROCK, MARY A. – SEE NEWBERY, M.A. SWAINSON, LILIAN – SEE HAMILTON, L.
SWETENHAM, VIOLET HILDA – SEE DRUMMOND, V.H. SWITHENBANK, EDNA – SEE MANLEY, E.
TANNER, MABEL E. – SEE SORRELL, M.E. TATLOCK, CICELY – SEE HEY, C.
TAYLOR, ALICE B. – SEE WINNICOTT, A.B. TEESDALE, GLADYS M. – SEE REES, G.M. THOMAS, MILDRED ELSIE – SEE ELDRIDGE, M.E. THOMPSON, AGNES – SEE HILL, A.
THORNYCROFT, MARY – SEE FRANCIS, M.
THURLOW, MARGARET C. – SEE LAMB, M.C. TIPPIN, ALICE B. – SEE MORETON, A.B. TUCKFIELD, DENISE – SEE WREN, D.
TUCKMAN, GHISHA – SEE KOENIG, G.
TUELY, DIANA M. – SEE LOW, D.M. TUFF, DAISY – SEE BOXSIUS, D.
TURNER, MARGARET – SEE FELLS, M.
TYLDESLEY, ALICE – SEE KENDALL, A.
TYTLER, MARY S.F. – SEE WATTS, M.S.F. WADE, CONSTANCE EDITH – SEE DUNN, C.E. WALLACE, OTTILIE H. – SEE MacLAREN, O.H. WALSH, EDITH – SEE NORRIS, E.
WARD, NORA – SEE ENGLAND, N.
WARNE, DORIS MAY – SEE GERRARD, D.M. WARNER, LOUISA – SEE AUMONIER, L.
WATHERSTON, MARJORY VIOLET – SEE GEARE, M.V. WATKINS, FRANCES J.G. – SEE MILLIGAN, F.J.G. WATKINSON, HILDA M. – SEE MACK, H.M.
WATSON, FRANCES – SEE SUNDERLAND, F.
WEBB, KATHARINE – SEE ADAMS, K.
WEBB, MARJORIE – SEE LANCE, M.
WELCH, LILIAN MARGERY – SEE DRING, L.M. WELD, EULALIA H. – SEE SWINSTEAD, E.H.
WELLS, LILIAN G. – SEE PARKER, L.G. WHELPTON, BARBARA FANNY – SEE CROCKER, B.F.
WHITE, ELEANOR JOAN – SEE ELLIS, E.J. WHITE, JESSIE MABEL P. – SEE DEARMER, J.M.P. WILDE, HELEN MARY – SEE COATON, H.M.
WILDE, WENDELA – SEE BOREEL, W.
WILKES, GRACE – SEE DIGBY, G.
WILKINS, AMY A. – SEE SANDHEIM, A.A.
WILKINSON, STELLA ANDRIA – SEE BURFORD, S.A.
WILLATT, EVELYN E.E.M. – SEE GIBBS, E.E.E.M. WILLETT, DOROTHY E. – SEE GOW, D.E. WILSON, HILDA M.L. – SEE PEMBERTON, H.M.L. WINDMULLER, RUTH – SEE DUCKWORTH, R.
WITTS, EMILY – SEE GRIFFITH, E.
WOODCOCK, BETTINE C. – SEE WALFORD, B.C. WOODHOUSE, FRANCES C. – SEE ROGERS, F.C. WOOLMER, ELEANOR MARY – SEE GRIBBLE, E.M.
WORKMAN, EMILY D. – SEE CORRY, E.D. WYATT, ETHEL W. – SEE CLAYTON, E.W. WYNN, SYLVIA S. – SEE KINGHAM, S.S.
YULE, MARY WINIFRED – SEE HAYES, M.W. ZIMMERN, MARIA – SEE PETRIE, M.